Originally posted here; this comment suggested that I ask this question on this site instead. The code at the bottom produces the correct drawing, shown below. 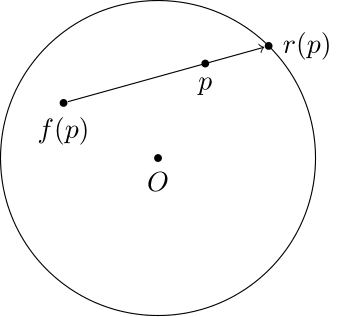 The issue is that I don't think I drew it in the best way possible; in particular, I really don't like having to construct (X) or (Y) (I would rather specify that the radius is 2 and that the ray should go in the direction of (p)). Can someone show me a better way? Browse other questions tagged graphics tex or ask your own question.